For this, it's worth learning a little Dutch: Laura zal dan de jongste solo zeiler ooit worden die rond de wereld zeilde ! Not too hard - it almost translates itself. 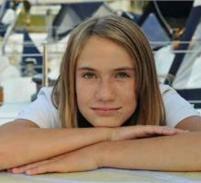 The ZGBlog Freedom of the Seas written in August 2010 told of how then 14-year-old Laura Dekker was about to try to sail solo around the world, and noted the obstacles put in her way be several governments. Now, despite them all, she's done it! ), they asked the Judge to take me away from my father and to lock me up in a secure clinic! "Government was not kind to me..." You've got it, Laura. They never, ever are. Kindness is outside their vocabulary. Even when they deliver favors, there is no heart in it. Just the pretense of an "entitlement", mechanically delivered. "May be considered unsuitable..." Y-u-c-k! By whom? Only two parties are validly involved: the young person, and her parents. By the self-ownership axiom, children are owned by nobody but themselves; the valid rôle of parents is discussed in the "Children" page on this site. In this case, both parties concurred. End of story. And the end, I hope, of Guinness' reputation and standing. It's had sixty years, and now they are over. I had already marked down Guinness beer as a mediocre, over-rated beverage (completely outclassed by Sam Adams Double Bock) and now the book can join the brew - down the sewer. Even Heineken of Amsterdam failed to take a big advertising opportunity; they, at least, have the chance to sponsor the trip after it's over, by making a contribution now. Mozart wrote his first symphony at age 8. Had government been so intrusive at the time it might have locked up his father Leopold and committed young Amadeus to a Latin school, admonishing him to keep to the approved curriculum until he was fit to choose his own activities. Beethoven was performing piano publicly at age 7. Same comments. Had their talent been throttled by government, the world would be incomparably poorer. Shirley Temple was a movie superstar at age 6. In later life she unfortunately frittered away her talents on government service, but meanwhile delighted millions. Her brightening of the Depression era would have been impossible, had some Department of Youth Services kept her in school. 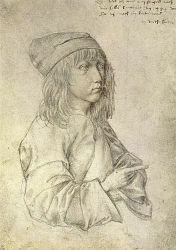 Albrecht Dürer was the pre-eminent Northern Renaissance artist, drawing this self-portrait at age 13 - because he would not submit to those who steered him in another direction. Michelle Wie qualified to join the USGA at age 10, and won the US Womens' Amateur Public Links contest at age 13. Hundreds of other child prodigies have enriched the culture of civilized human society; yet government and its allies in industry and the media are trying to suppress them, make them conform to a bland, uniform standard of mediocrity. In the coming zero government society, all such nonsense will end; children as well as adults will be all that they can be. Humanity will prosper as never before.